Christmas is, of course, excitedly and eagerly expected by all the children. It is the time for surprising gifts and time for fun crafts. Kids love to paint and make something by themselves, whether it comes to pastries or to chaos-creating.... Christmas is, of course, excitedly and eagerly expected by all the children. It is the time for surprising gifts and time for fun crafts. Kids love to paint and make something by themselves, whether it comes to pastries or to chaos-creating. Put your oven onto about 100 degrees C. Measure out and mix together the flour, salt and water until it turns into dough. Knead for a bit. Either roll out your dough ready for cutting or shape by hand. We don�t usually start Christmas crafts until December but with a very excited 3 year old in the house someone couldn�t wait any longer. 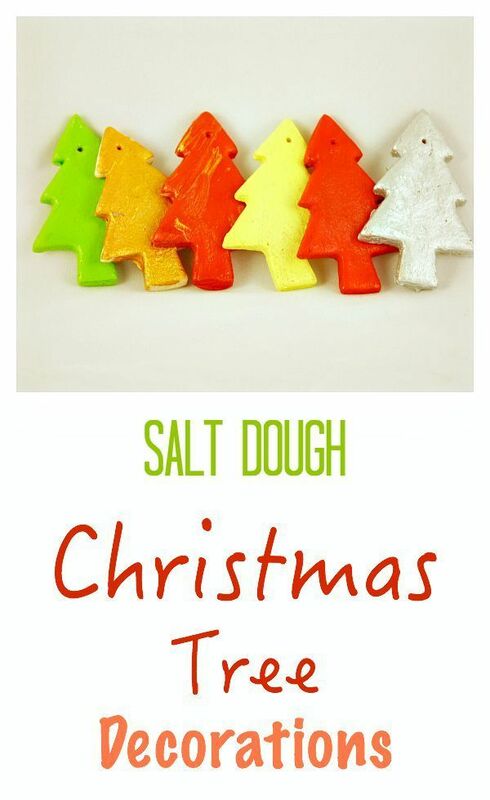 So first up we�re sharing our Christmas salt dough decorations. I remember making salt dough ornaments with my mother for Christmas. We made the most adorable cinnamon gingerbread men (they smelled amazing and oh so Christmasy). We made the most adorable cinnamon gingerbread men (they smelled amazing and oh so Christmasy). Your kids will have a great time rolling out the dough to 1/4 inch thickness, and cutting out their ornaments. The toothpicks can be used to prick decorative holes or lines in the ornaments. Different colors can be mixed to create more dimension.